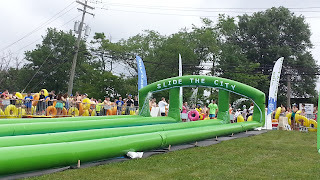 I was compensated 4 VIP tickets from Slide the City. All opinions are honest and my own. 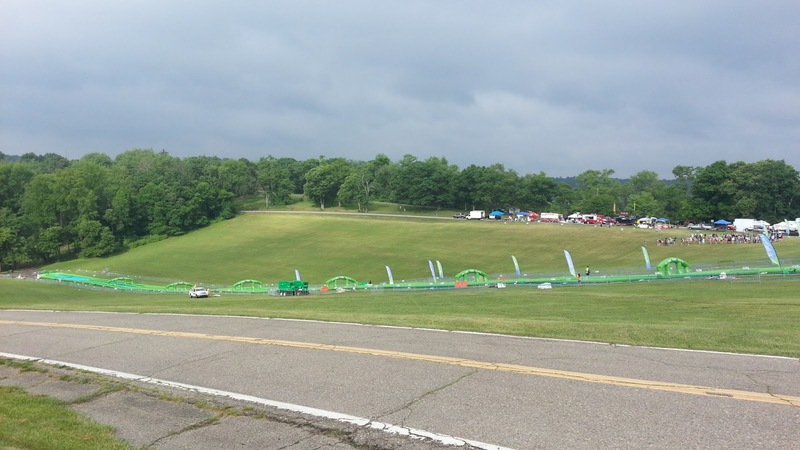 How many times do you get to see a 1,000 foot slip 'n' slide? But that's exactly what this is! Growing up, there was a Slip 'n' Slide across my back yard almost every day during the summer. Honestly, I'm surprised the grass in my parent's yard ever grew back. So you can only imagine how excited I was when I heard Slide the City was coming to Pittsburgh. There was no question about it. We HAD to go! The kids were over the moon excited when we told them we had tickets to go. Thankfully those clouds you see in the picture above moved on as we were waiting at the registration table to get our stuff. With our inner tubes in hand, we made our way towards to top of the slide. Each slider was required to have an inner tube. Although they were handed out to every ticket holder, people had the option to bring their own. We also had the option to pay for the volunteers to inflate them, but we chose not to. 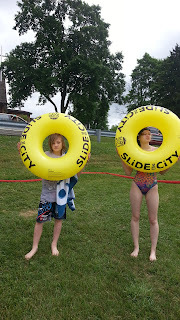 The kids struggled to blow theirs up so after blowing up FOUR inner tubes, we did regret not paying a few bucks to have someone else do it for us. But once we were done blowing, we were ready to start sliding. Because we weren't sure how the kids would do, we chose to go into the family / group line so we could slide together. All it took was one slide for all of us to be hooked! Because we had VIP tickets, we could slide as many times as we wanted. Those tickets also got us early entry. 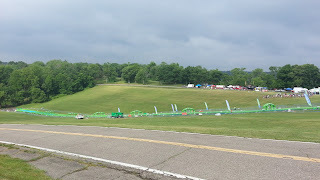 During the time we were there, the slide was shut down twice. At first we were told to go down head first. I'm not sure if laying that directions really made you go faster or if it just seemed faster, but I was not a fan. Everyone was eventually told they had to sit on their tubes, but some people were still going down the slide faster than anticipated. For anyone ready from this area, you know what Sunny Slopes looks like. That hill is a bit steep. Steeper than it looks in my pictures. 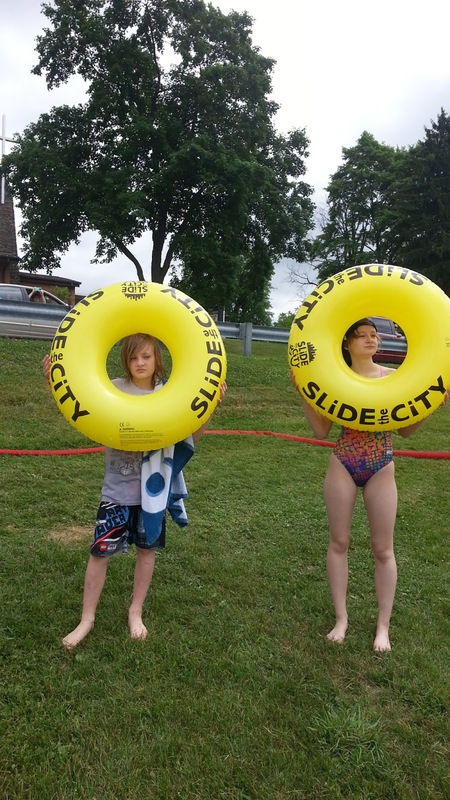 I don't think the owners of Slide the City realized how that hill would effect the slide, but I am glad for the stoppages so they could make it safer for us sliders. The husband didn't go down as many times as the kids and I did. He is recovering from an ankle injury so after being told he had to sit, he didn't want to injure it again so he chose to watch the three of us continue to slide. 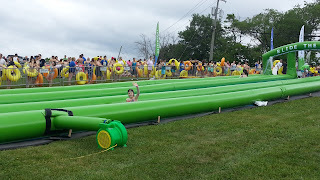 We continued to slide away for over two hours, but once the slide opened to the general public, we decided to call it a day. The lines were getting rather long, we were all getting hungry, it wasn't exactly a hot day, and whether the kids would admit it or not, they were getting tired. All of those are a recipe for disaster. 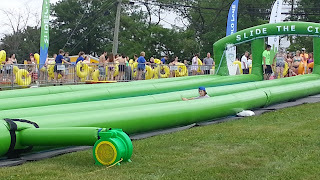 Participating in Slide the City definitely brought out the kid in me. And I know my actual kids had a blast. Both of them thanking us multiple times for taking them is usually a good indicator of a good time. 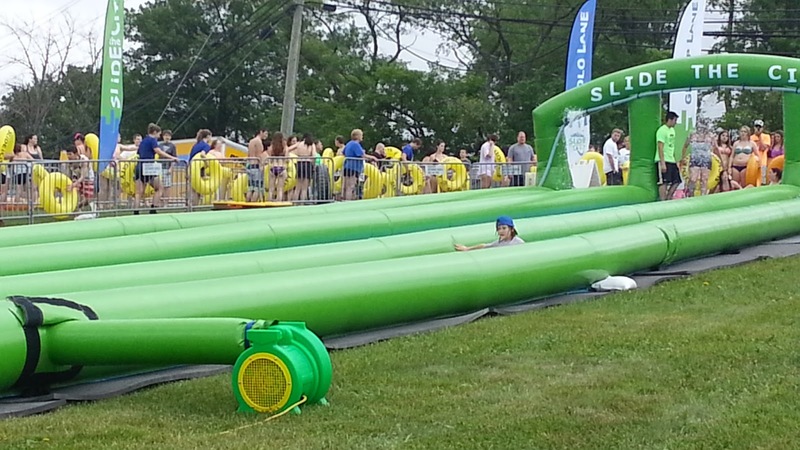 If Slide the City were to come back next year, it would for sure be on our summer to-do list!